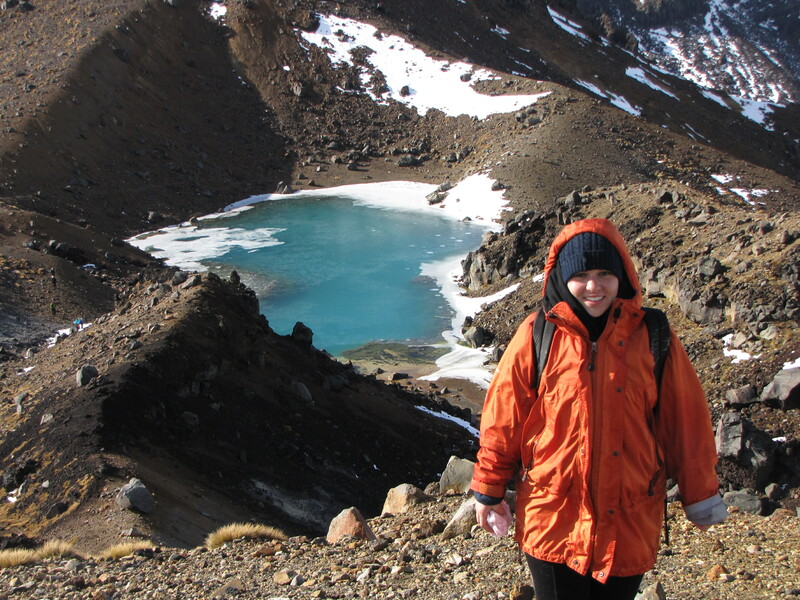 Ok, before I start talking about how incredible the Tongariro Alpine Crossing was, I must give what I believe will be the most useful advice you will receive before traveling to New Zealand. Buy waterproof hiking shoes; yes, you need them, yes, you should spend $200-$300 on a pair and no, it is not silly to spend that much money on a pair of very ugly shoes. Now there will be two types of people when they hear this advice. The first kind are those who are thinking “What is the amateur hour, of course you need hiking shoes!” the other kind is like me who is thinking “I can buy a beautiful pair of shoes for that much money, I would never spend that on sneakers!” If you are like me, take it back! It will save you a lot of pain and possibly your life. So if you plan on doing hiking in New Zealand, you will need hiking shoes; especially when there is SNOW on the ground! It will also save you hours of being uncomfortable in completely soaked socks and shoes that will now be 10 times heavier and will make you much colder. 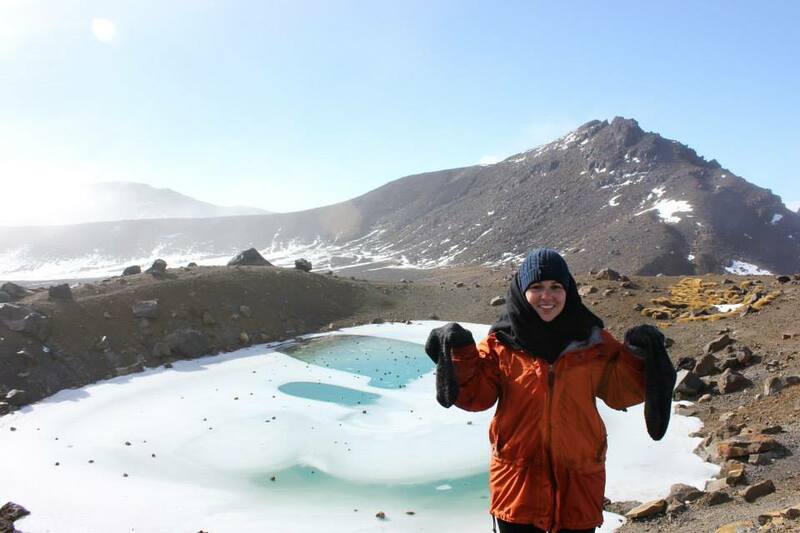 Now that I have added that little plug in, let me tell you about how much harder the Tongariro Alpine Crossing was for me because I thought Puma sneakers would suffice. This weekend was a long weekend because Monday was the Queen’s Birthday, making Monday a public holiday. Tony, Ryan, Lyssa and I left Auckland for Taupo on Saturday at noon and arrived around 4:30pm. 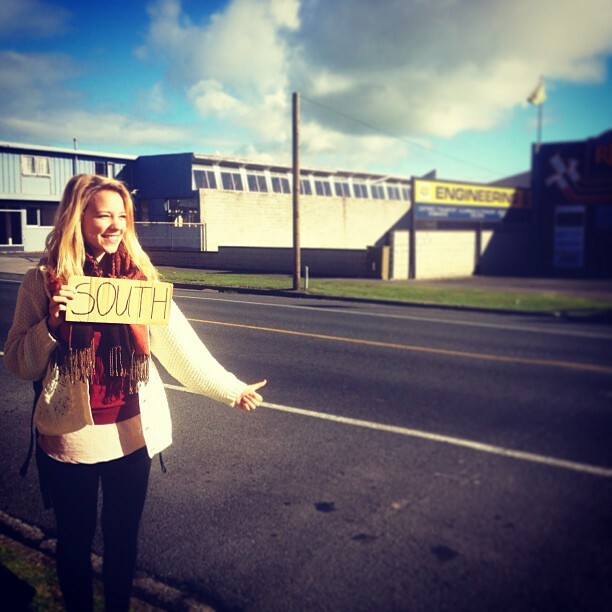 Our friends Rachel and Gemma decided to hitch hike to Taupo- yes hitch hiking is legal and a common, safe practice in New Zealand- and we ran into them in Matamata. We did a quick pull off to tell them we had no room and “see ya when we see ya” and went on our way. About 30 minutes later a blue BMW pulled up to us on the highway and Rachel and Gemma were waving at us from the back seat. Two hours later we arrived in Taupo. Our first order of business in Taupo was food shopping to prepare for our night camping and 7 hour hike the next day. 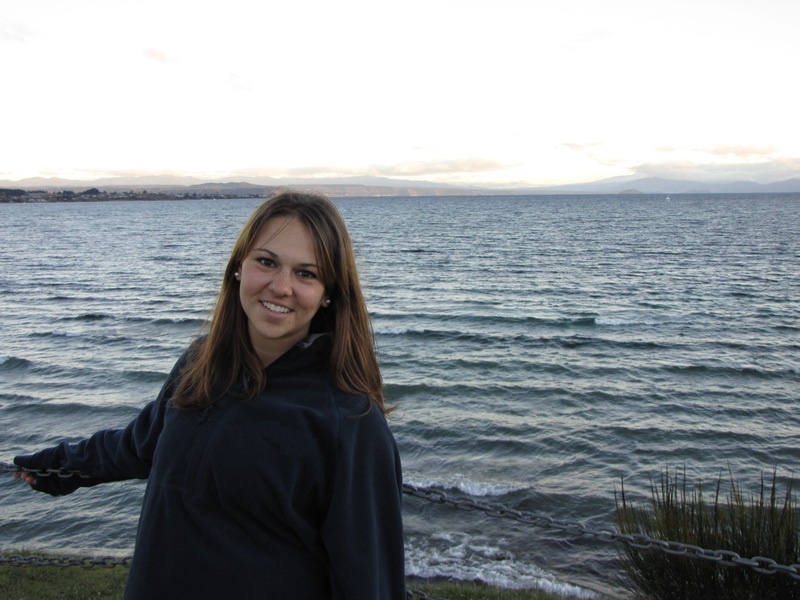 When we were done we met Rachel and Gemma at Lake Taupo which is the main attraction of Taupo. After the sun set over the lake we all went for dinner in town to a pizza place called Hell. After dinner we dropped Rachel and Gemma off at their backpackers and we drove the last hour to the Mangatepopo Car Park and starting point for the crossing. Tony and Ryan were very courageous and pitched a tent outside and Lyssa and I opted for the warmth and slept in our car. At 3am, Lyssa and I both woke up and spent the next couple of hours talking about our life plans. We agreed we had to table this conversation and we should get some shut eye because we had a very long day tomorrow. When the sun rose, so did we. Our official starting time was 8:35am and we knew it was going to be a long, cold day. We dressed in lots of layers but the first hour and a half was a flat walk and we became overheated. We stopped and took off our hats, sweatpants, scarves and jackets and continued on. We passed the Mangatepopo Stream and as we ascended we saw drastic change in the shrubbery. 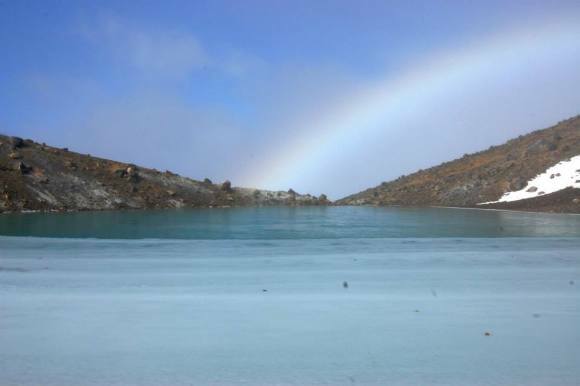 Once we reached Soda Springs we had to climb up the Devil’s Staircase which brought us from 1400 to 1600 meters above sea level.There was very low visibility so sadly we were not able to see the volcanic cones of Mt. Ngauruhoe (famously known as Mt. Doom from Lord of the Rings), Mt. 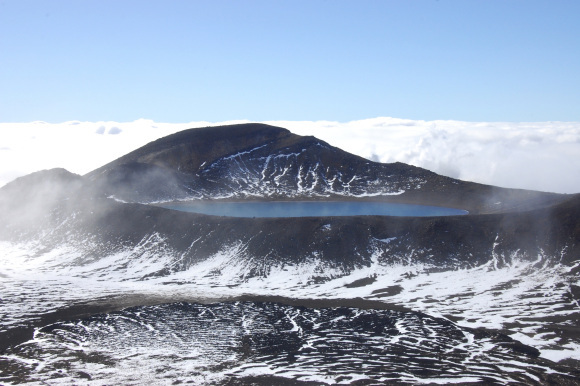 Tongariro or Mt. Ruapehu, which are all still active volcanoes. The entire Tongariro Alpine Crossing is 19.4 kilometers and is considered one of New Zealand’s Great Walks.The Great Walks are said to be suitable for all ages, even 80 year olds but I had a hard enough time as a 20 year old, so I am not exactly sure what this says: that the rating is not that accurate or if I am just very out of shape. 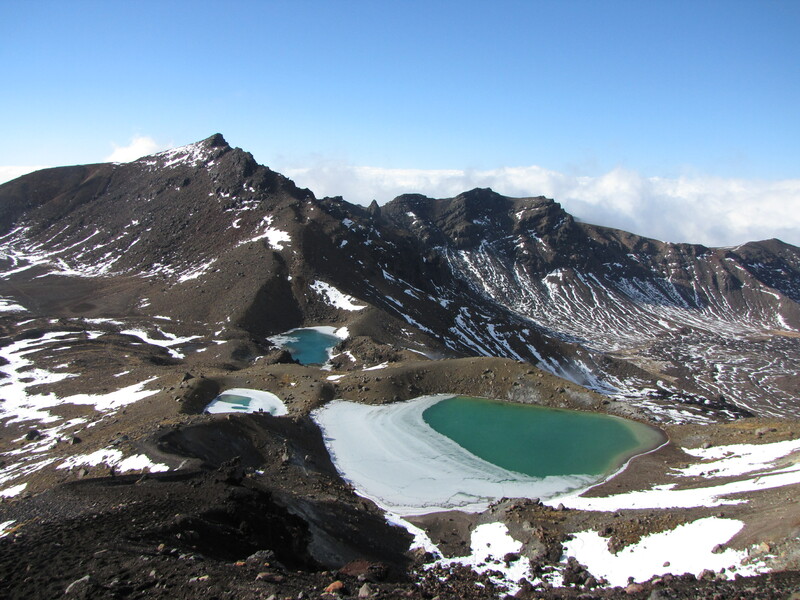 The Tongariro Alpine Crossing just reopened 2 weeks ago and was closed because of a volcanic eruption that occurred in November 2012. 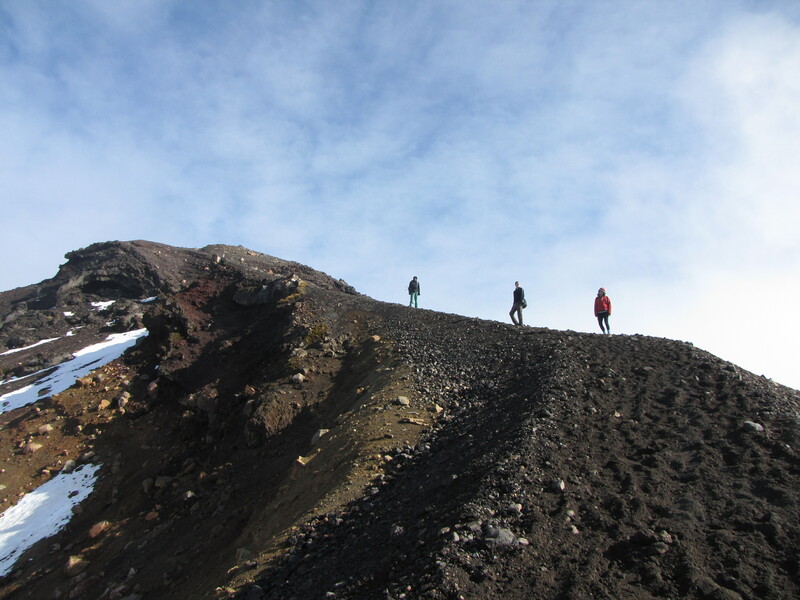 All around us was deposits of volcanic ash and rock and as we continued to climb the snow levels grew higher and higher. After the Devil’s Staircase we reached the base of Mt. Ngauruhoe and the start of the South Crater. 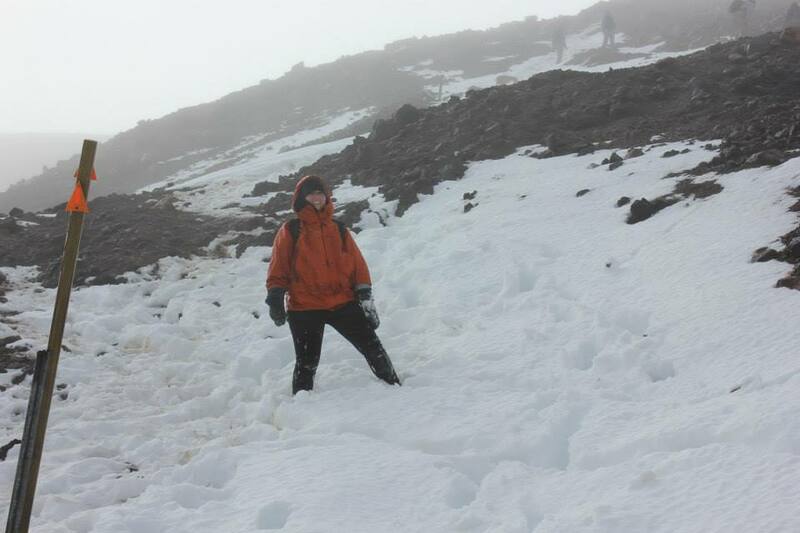 We had hoped to be able to hike to the summit of Mr. Ngauruhoe, but the thick fog and snow levels would have made the hike much more challenging and would not have allowed us to see anything. 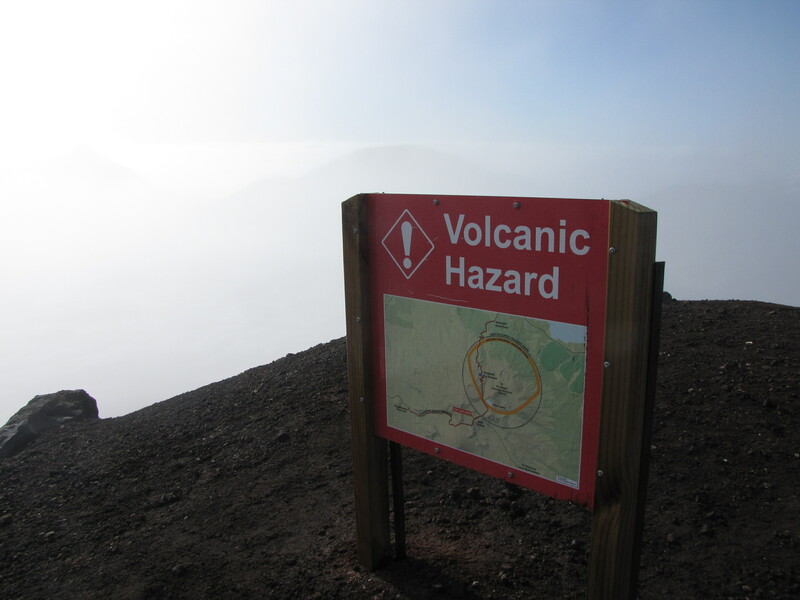 The South Crater was a very difficult point because here the temperature dropped 20 degrees and there were 40 mph winds smacking us in the face. This was also a very narrow part and I was slipping and sliding all over the place. From the South Crater we walked to the Red Crater. This was another flat area that was filled with snow and slushy areas. At this point I had to abandon trying to preserve the dryness of my feet and carry on. My socks and shoes were soaking wet and my toes turned numb. With all of my extra layers in my backpack, now would have been a good time to layer back up but there was not a dry spot on the ground so we just continued on. 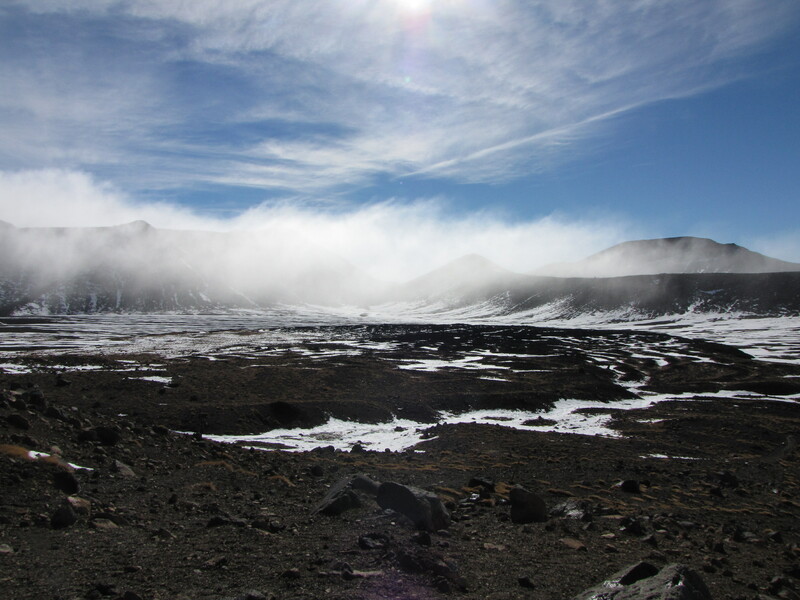 This was a very big mistake because once we began climbing to the Red Crater the wind became violent again and the only way we could hear one another was when we sought shelter behind large rocks. The Red Crater was awesome to look at but a little scary because the wind was so strong, and if you fell in, you would not be making it back up the very steep cliff. We decided to move away from the edge and head down to the Emerald Lakes so we could enjoy our lunch. Going down the very large, steep hill to the lakes was quite easy because the ground was covered by loose scoria and I did not have to lift a foot the entire way down; it was like I was skiing with sneakers on. This part completely ruined my sneakers, and I fell on my behind more times than I could count. When we made it down we looked for a rock to hid behind and we cracked out our sandwiches and ate right next to the frozen lake. It was much too cold to hang out for a while so we packed up again, took some pictures and made our way back. To complete the crossing you would continue going forward but because we did not have a “pick up” car and we left our wallet in the car, we could not take the shuttle back to our car park, and we had to head back to where we started. Now the same hill that was so easy to slide down was absolutely brutal climbing up. It was one step up and three steps backwards the entire way. This was the best calf workout of my entire life and I would never want to do it again. At the top of this hill was the best view of the three Emerald Lakes and the Blue Lake in the distance. We descended from the summit in a a quarter of the time it took us to climb up. Because my sneakers had no traction, it was very difficult to walk so I resorted to sledding down the mountain on my bum. Hitting into a couple of rocks, I am sure I will have so nice black and blues to serve as battle wounds but it was great fun! When the snow was too powdery to slide down Ryan recommended skipping through the snow. Doing so, and not realize how deep it was, my leg got stuck and my body flew face down into the snow and my backpack flung over my head. Ryan scrambled to take out his camera, but he was laughing so hard that he wasn’t able to capture the moment before I got up. We got down around 3pm and the whole journey took us 6 hours 25 min which was great timing given the conditions. The hike was one of my favorites so far but I wish I had done it earlier in the semester. This was Tony’s second time doing the hike, his first was during the Easter Break, and he said that it looked completely different from last time. If you are considering doing this hike you should look at the website because it is important to be prepared for all conditions!